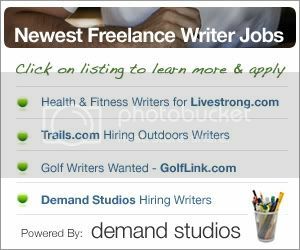 Good morning Freelance Writing Jobs community. I had a full on working weekend, yet didn’t even cross off half the items on my “to do” list. Mind you, that’s not a complaint. I did some fun family things, but mostly the other residents of Casa Ng were doing their own things and it was a good time for me to play catch up. Someone once asked me if I wouldn’t rather spend weekends doing what I enjoy. The truth is, I enjoy my work and I’m not quick to ditch it once the weekend comes around. I’m a workaholic for sure, but not so much that my family never sees me or I don’t take some time out for myself. Some folks like to relax with a movie or a good book on the weekends, I like to blog or write. Here’s to a positive week. Remember, on Monday everyone has a clean slate. Chicken Soup for the Soul – Not sure about current pay, but when my story was accepted (several years ago) I received $300 in payment. The Bank – Negotiates payment individually. Love Mondays but a bit behind on volunteer work for a newsletter. That happens some times when other work (paying) gets in the way. I am now a Twitter and finding that it will definitely help my writing career. Have a great week as we round out the end of the month. February is my favorite month, love them humming birds! I just sold a story last fall to Chicken Soup – the pay is still $300 per story, plus 10 copies of the book in which your story appears. I heard that Cricket magazine and the others in its publishing group have not been paying their writers. Do people really want to be getting finance and tax advice from people who wrote the articles based on “little to no research”? .-= Joy Smith´s last blog ..Win a MagnaPods Cosmetic Organizer and Toothbrush Holder! =-.